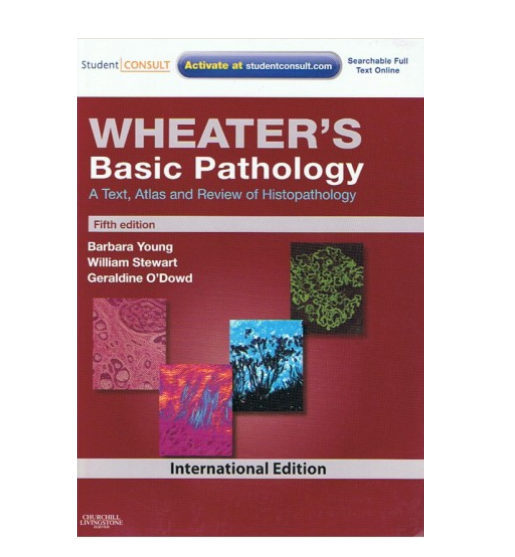 Wheater's Basic Pathology: A Text, Atlas and Review of Histopathology, 5th Edition, by Barbara Young, BSc, Med Sci(Hons), PhD, MB, BChir, MRCP, FRCPA, Geraldine O'Dowd, BSc(Hons), MBChB(Hons), FRCPath and William Stewart, BSc (Hons), MBChB, PhD, DipFMS, FRCPath is a pathology resource that offers a comprehensive introduction to the subject first by covering fundamental pathological processes and then addressing the common diseases encountered in systems pathology. Hundreds of high-quality images illustrate the essential features of pathology and make it easy to make definitive comparisons to your own lab samples, while concise captions enable you to quickly and easily understand key points. New online access via Student Consult further enhances your study of the material with additional valuable content including USMLE-style questions and much more.